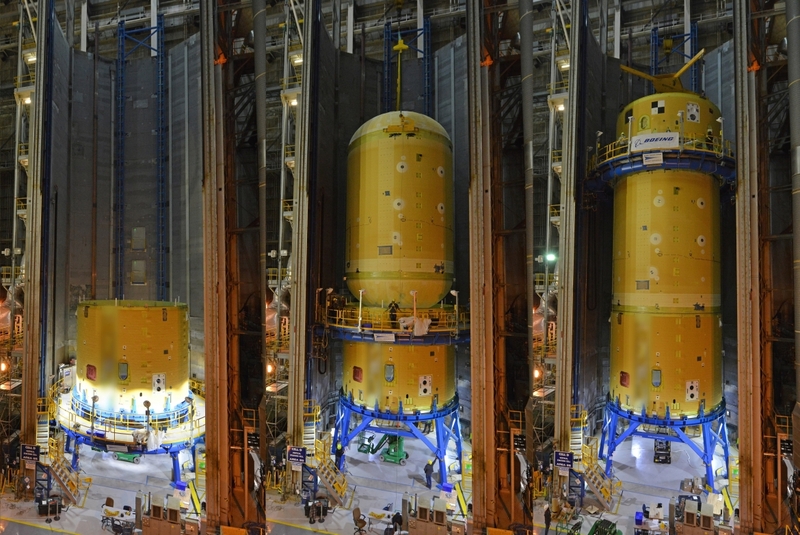 The top half of the first NASA Space Launch System (SLS) Core Stage now stands assembled in a vertical stacking cell at the Michoud Assembly Facility (MAF) in New Orleans. Prime contractor Boeing bolted the three elements, the forward skirt, the liquid oxygen (LOX) tank, and the intertank together in January at Michoud. After connecting the elements, Boeing is working to button up the “forward join” and get the assembly ready to connect to the rest of the stage later in the year. Technicians are working in Cell D at MAF to install the remaining major hardware pieces inside the join, plug cabling together, and cover the bolted connections with insulating foam.